The class, character and warmth of this blend will utterly win you over. 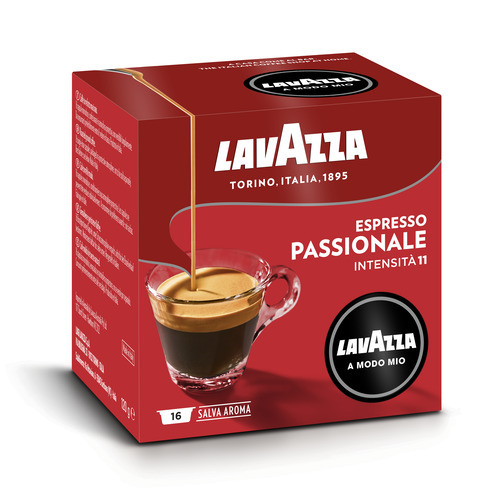 Dark and full-bodied, this superb blend is the pinnacle of 110 years of Lavazza passion and expertise in the creation and preparation of great Italian coffee. The Arabica coffees of Brazil, full-bodied with notes of dried fruits, harmonise with those of India, with their intense sweet aromas. These qualities, along with a rich strong roast, give a deeply balanced and full, slightly caramelised flavour, smooth and rich in smokey toasted notes. Davide Oldani, the "pop democrat" of Italian cuisine, interprets the Appassionatamente blend. "Appreciating the roundness, touching the fullness, breathing the aroma of caramel notes." Torta di Nocciole (hazelnut cake) from The Langhe of Piedmont is epitomised by the delicate aroma of toasted hazelnut. The hazelnut cake brings out the candied dried fruit notes of Appassionatamente.